Big bursts of fireworks in the sky set an unforgettable scene, bringing a bold & festive touch to this birthday card for your son. What an awesome way to wish him the brightest celebration yet, while reminding him that the best is yet to come. It's a greeting that's sure to get his attention and let him know just how much you care. 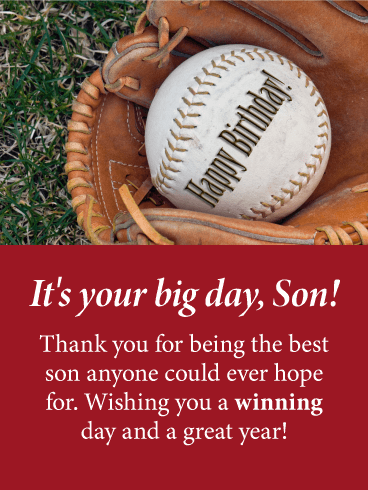 Hit a home run with your son this year by sending this fun baseball themed birthday card. The glove holds a baseball that sports the words Happy Birthday! 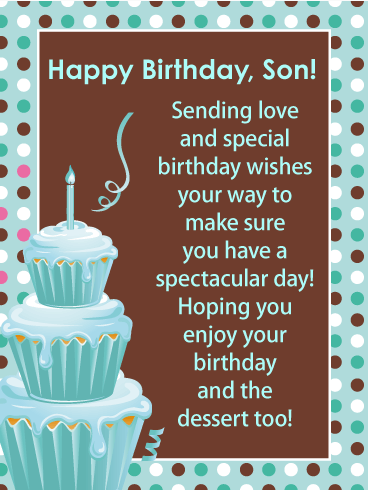 He will be happy about the fact that you are taking the time to send him a birthday card that you know he will love. 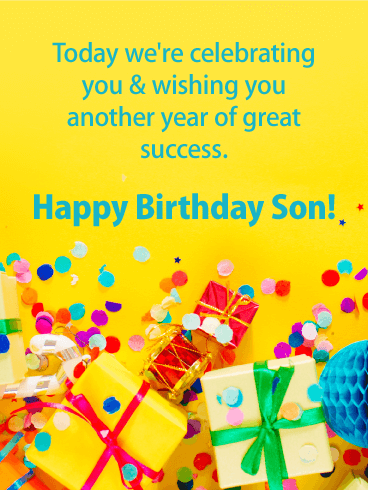 So wish your son a winning day and a great year with this birthday card that will score big with him on this special day! This birthday card is heart-felt and sentimental. Your son will feel loved and inspired. Parents are in the best position to give sage and sound advice to their children and this birthday card does that in a loving and caring manner. He will feel your love and support when he first sees this uplifting and beautiful birthday card. 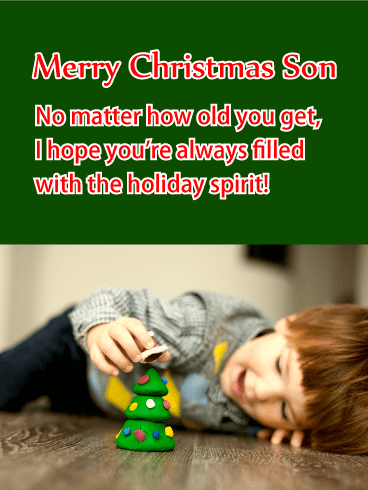 Any son would love to receive this card. Two wrapped gifts sit side by side, ready to surprise somebody special this holiday season. What a wonderful way to celebrate your son at Christmas. 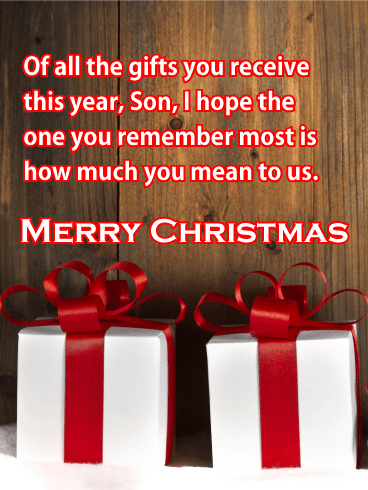 It's a chance to let him know that he is the greatest gift of all in your life and you hope that's something he takes with him not just during this magical time of year but all throughout the year. 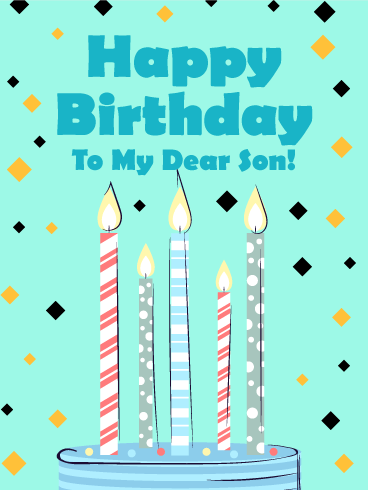 Here's a festive card to help celebrate your son's birthday in style! A background full of colorful confetti brings a bold touch to this fun greeting, while the words in front are sure to capture his attention. It's a chance to let him know that this day is all about him and that the year ahead is going to be awesome and full of great success. Nobody deserves it more! 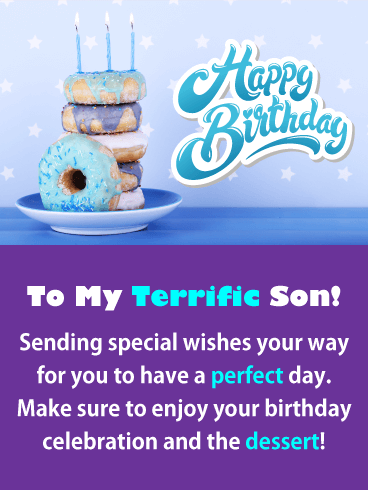 Got a sweet son celebrating a birthday? This festive birthday card is the perfect pick to make him smile! A cupcake loaded with white frosting and blue sprinkles lets him know that his day is guaranteed to be filled with fun. The best part is the thoughtful message, which will remind him that it's his time to shine and that all his wishes are sure to come true. 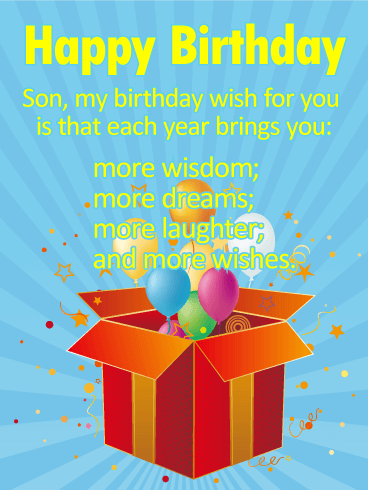 Here's a brilliant birthday card for the very best son around! A cake topped with sparklers and bright lights in the background are sure to light up his celebration just as much as his smile lights up your world. It's the perfect greeting to get his attention while letting him know how amazing he is and that you're wishing him a year ahead that's full of happiness. 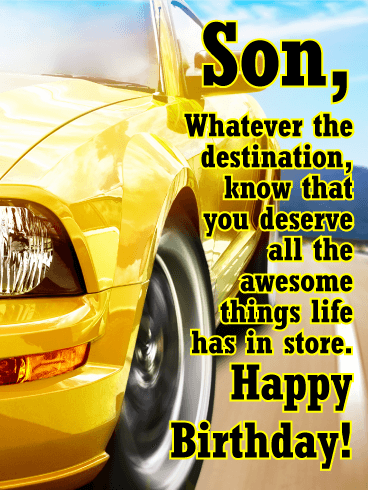 Your son is sure to get revved up by this car-themed birthday card! A yellow sports car hits the road, setting out for a high speed adventure, the same kind of journey that begins as he celebrates this special day. 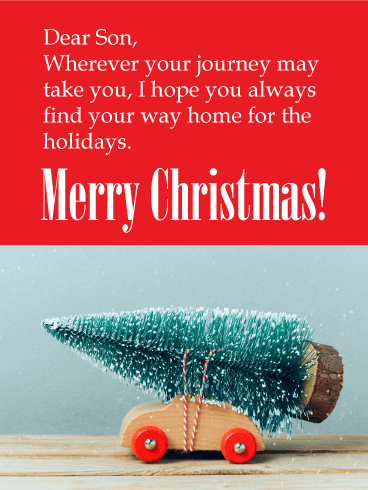 It's a chance for you to let him know that whatever the destination may be, there are some awesome things waiting ahead for him, with no stopping in sight! On a day as special as this, only a special card will do. 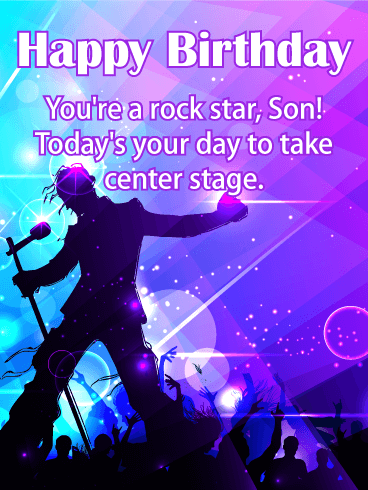 And this rockin' birthday-themed greeting for your son definitely fits that description! A rock star takes center stage in front of a huge crowd, microphone in hand and colorful lights behind him. 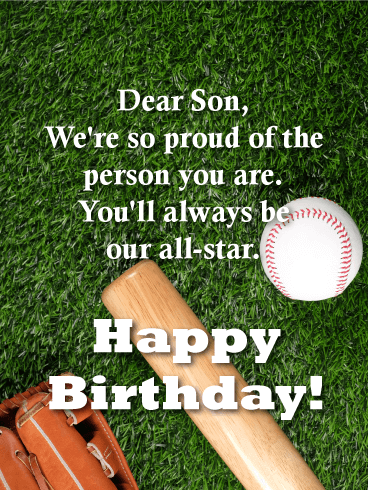 What an awesome way to help your son celebrate while reminding him that he is always a star in your eyes and that you'll always be his biggest fans. Strength, determination, endurance. Your son has so many amazing qualities. 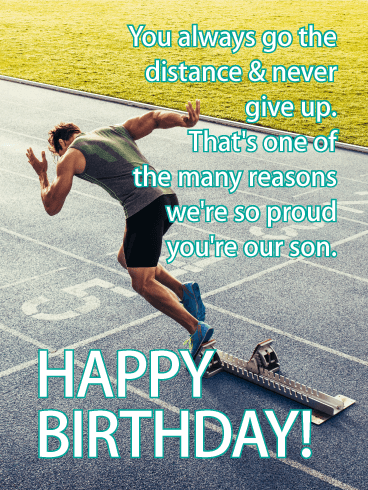 Let him know on his birthday with a birthday card that goes the distance to help him celebrate. A runner has just left the starting line, ready for the race ahead of him. And just like your son, he'll do his best to get to that finish line and take first place. 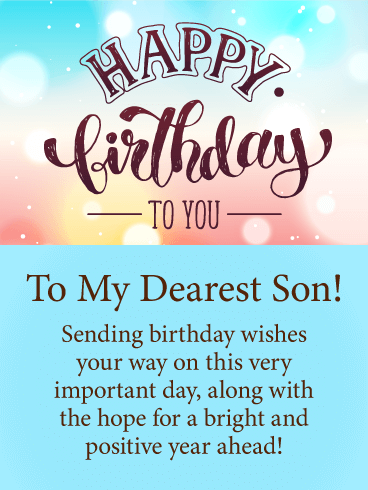 Your continued love and encouragement are expressed in the heartfelt words and wishes, letting your son know how proud you are of him, not just today but every day. 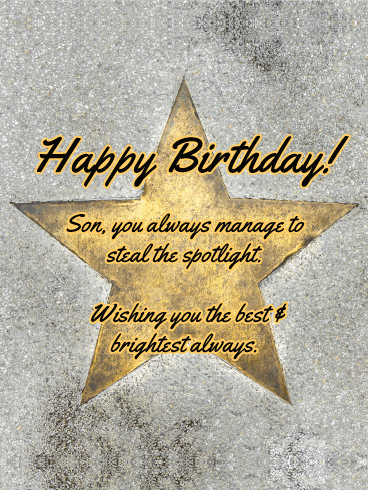 Your son's got star power, and his birthday is the perfect opportunity to let him know! This stellar card will make him feel like the standout he is as he celebrates another year of stealing the spotlight. The words are impactful, wishing him the best as he looks ahead to a bright future. Nobody deserves it more! You son is an all-star in every way. 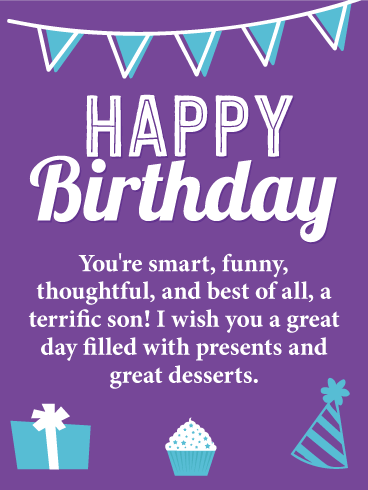 Let him know with this winner of a birthday card! A baseball-themed background features a bat, ball and glove on the field as a nod to the sport he loves so much. And the words are what makes this greeting so thoughtful. They reveal just how proud you are of him, while wishing him a celebration that's a home run in every way. You've always told your son that life is an adventure, and as he celebrates his birthday, it's a chance to look back on the year that has gone by while looking forward to the future. 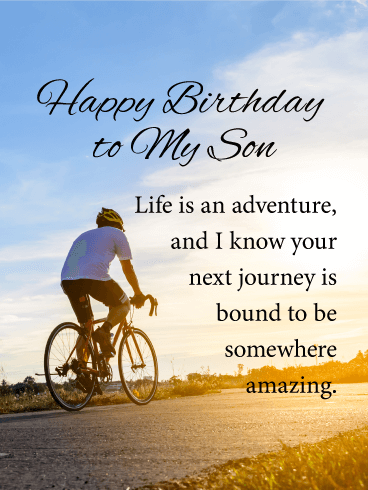 This heartfelt birthday card features a cyclist poised for his next journey, which is the perfect symbol for all the amazing things that lie ahead for you amazing son. He's sure to be touched by your thoughtful words, wishing him well on his big day. 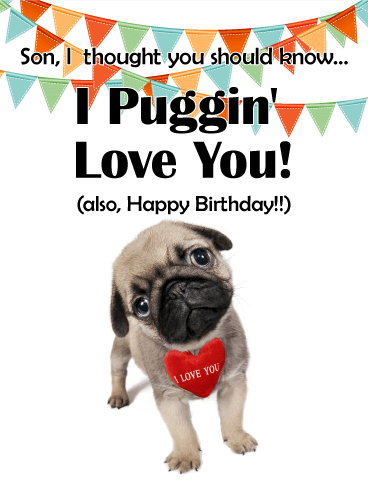 No one can resist a cute puppy, no matter how old they are, and this birthday card comes complete with the cutest birthday puppy that will melt your son's heart. The message will also put a smile on his face as he reads that you are proud of him and all that he has accomplished! 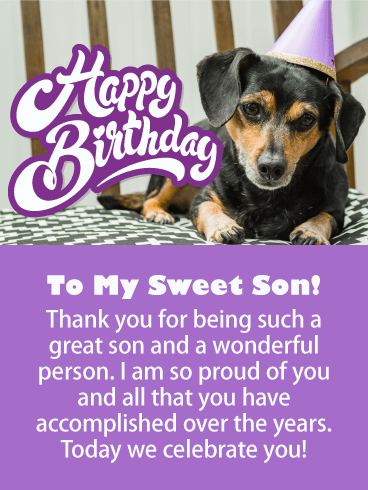 Let your sweet son know how important this day is to you by sending this adorable birthday puppy his way now! 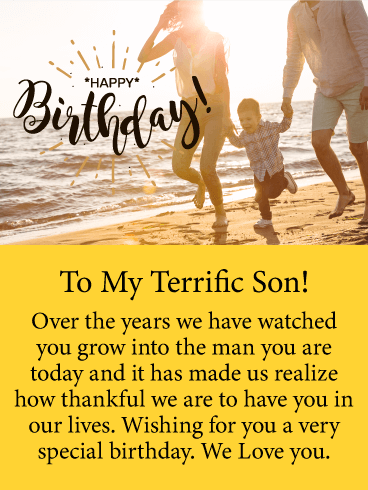 Watching your son grow into the man he is today has made you realize how thankful you are to have him, and this birthday card will let him know! This touching greeting card features a lovely image of a son with his parents, it certainly represents a close family and the love they share. 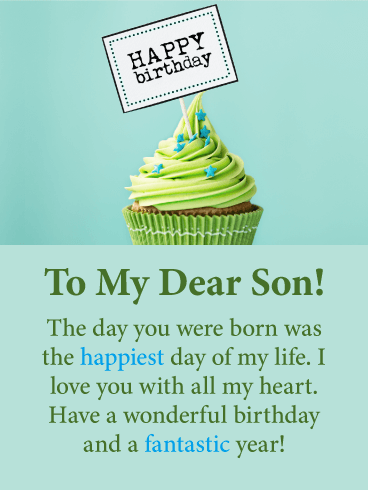 Send this meaningful birthday card to your son to let him know how much you care for him, he will really appreciate it. Fireworks represent important occasions that are worthy of big celebrations and your son's birthday certainly falls into that category! This spectacular birthday card features sparkling fireworks of blue and green. A fabulous sight to see! It will remind your son this is no ordinary day. 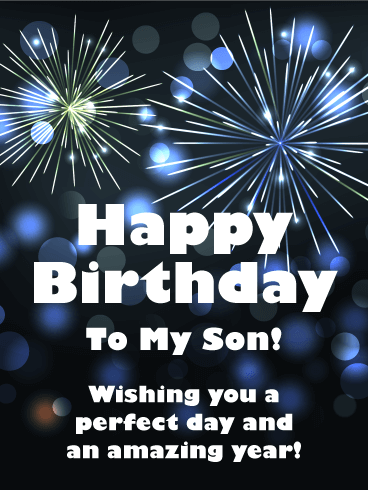 Make sure to send this birthday card soon to wish your son a perfect day and an amazing year! It will let him know you are thinking of him on his big day. This sensational birthday card gets right to the point and will wish your son a happy birthday as soon as he sets eyes on it! It features large lettering that says Happy Birthday To My Dear Son, it can't be missed and it will bring a smile to your son's face! 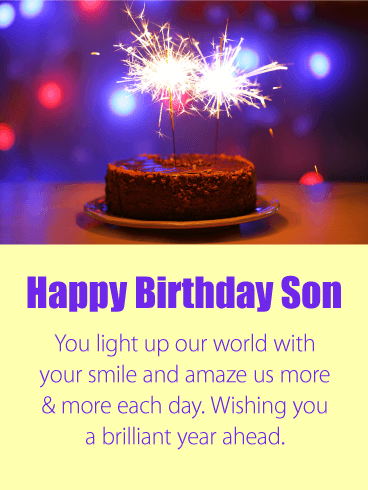 It also displays wonderful lit birthday candles with a special decorative background that will brighten your son's day. Birthdays are supposed to be happy and this birthday card will surely make that happen! 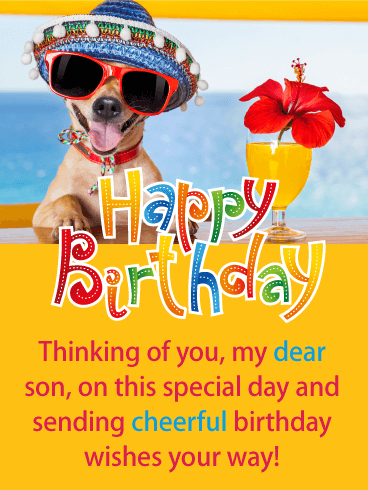 Send a bright and cheery birthday card to your son for his grand occasion! 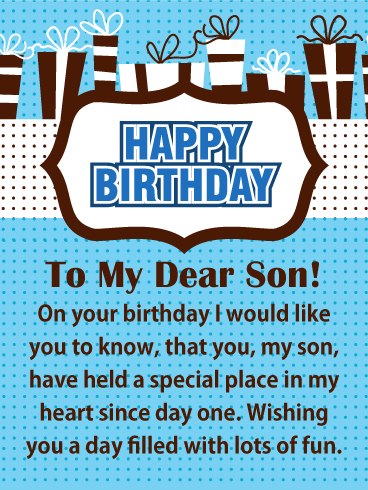 This greeting card was designed to add joy to your son’s birthday and let him know that you are thinking of him. It features bright colors of blue, red, and yellow, along with the words Happy Birthday To You! 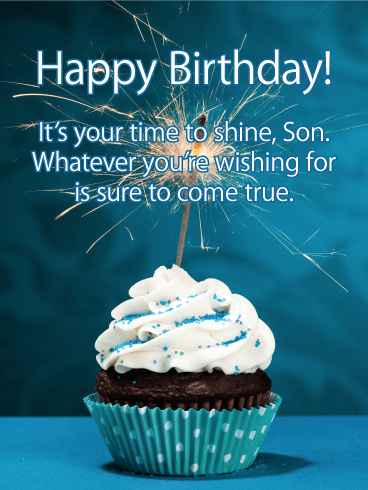 Be sure to send this birthday card to your son soon so he can start his big day off with a smile! Everyone loves compliments, and this birthday card is full of them! It expresses to your son that you feel he is smart, funny, thoughtful and terrific! This greeting card features great colors of purple and blue, along with birthday icons such as a present, cupcake, streamers, and a party hat! 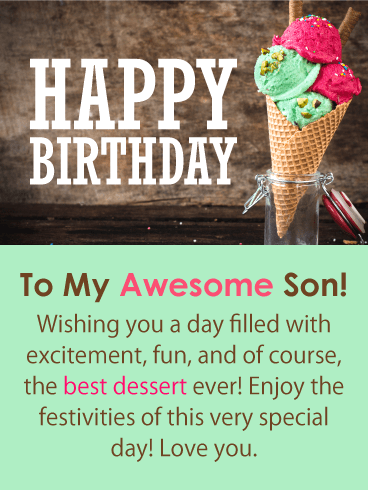 Use this awesome birthday card to wish your son a day filled with great desserts and presents, he will appreciate it. Your son is going to love this fantastic birthday card! It features a great image of a dog, hamster, bird, and cat celebrating with balloons and fireworks! The birthday card's message ties in with the image by saying no matter who you celebrate with, have the best time ever! Such a fun birthday card! 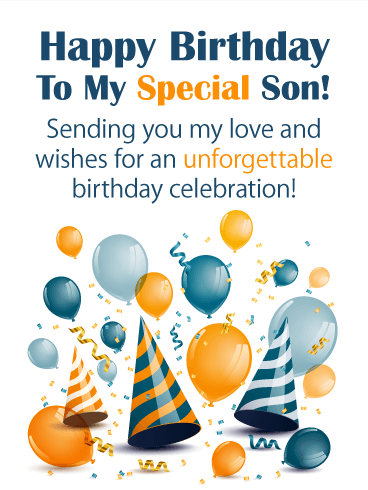 So wish your son an exciting day with this colorful greeting card that will add a little joy to his day! It's always a great feeling when a mother can be proud of her son, and it's even better when it's expressed on his birthday! 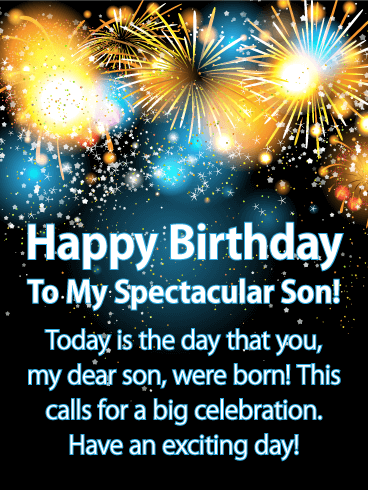 Let your son know just how proud you are of him and who he has become with this sparkling birthday card! It features a festive image of birthday items such as a party hat, ribbons, presents, along with a purple glimmering background! 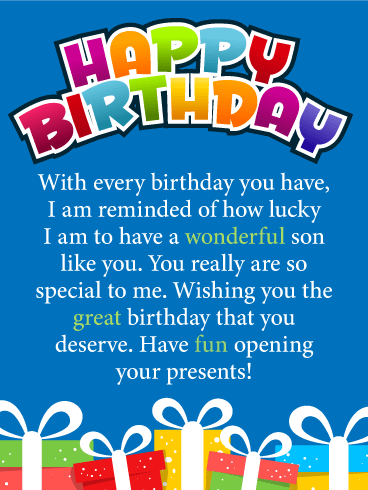 Send this birthday card out today to tell your son to have a great day! Delightful and thoughtful! 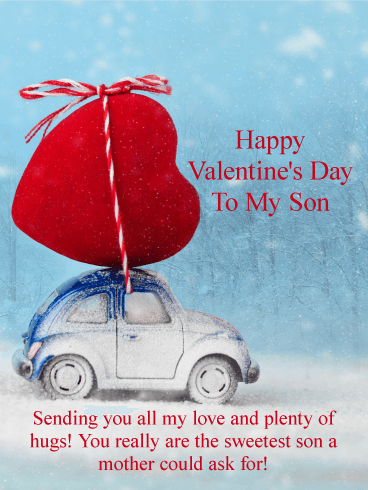 Send a Valentine's Day greeting card to your dear son today. This loving Valentine's Day card for a son lets him know you're thinking of him always. Sometimes boys are hard to shop for and to speak words of love to, but not this year! This sweet Valentine's Day greeting card is perfect for any son, near or far. 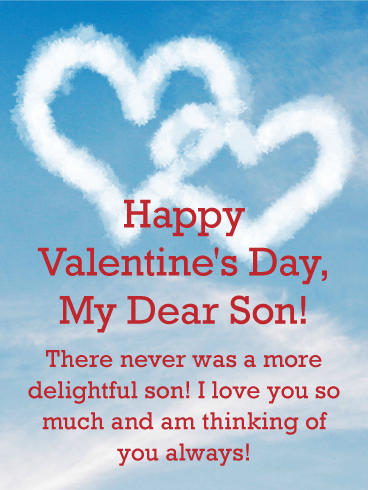 Let your son know what a delight he is to you and how much you cherish him with this special Valentine's Day card. Pizza and video games are a match made in heaven. 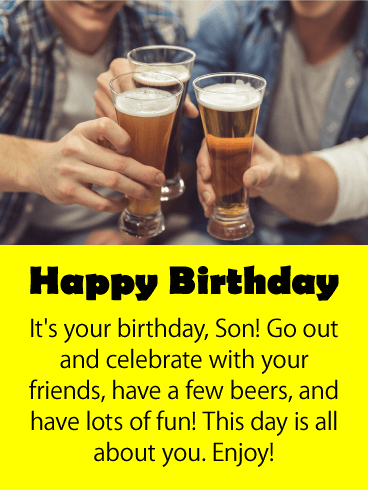 Send this funny birthday card to your son for his birthday. If he's like most boys (and men!) there's nothing he'd like better than to kick back and relax with a controller in one hand a slice of pizza in the other! 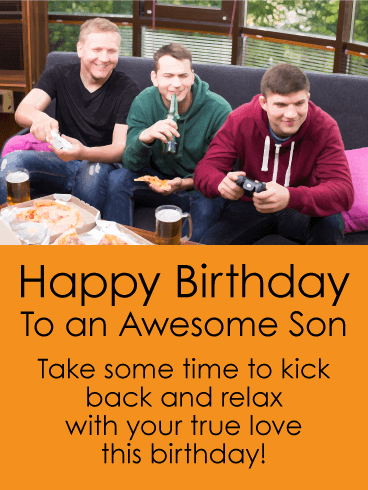 This funny birthday card is perfect for your game-loving son on his birthday this year. Your son's time has come. He's no longer cutting edge, he's officially "old school!" It's a right of passage. 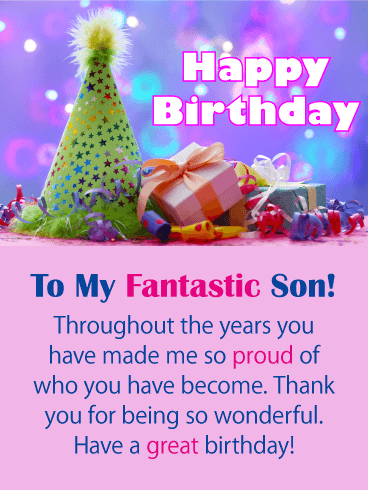 Celebrate your son's birthday and send a funny birthday card to show your love, support, and good sense of humor. Growing older comes with its own perks, like lots of great memories from "back in the day!" 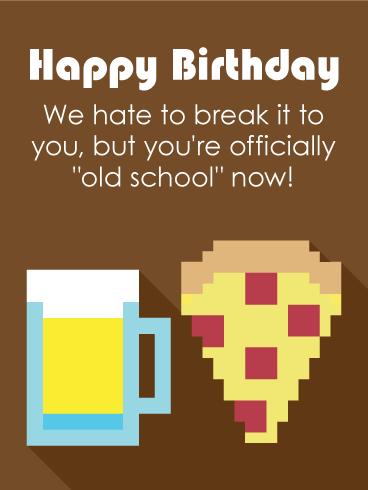 Send this nostalgic pixel art birthday card to your son. He'll remember the fun he had as a kid playing video games, but can still smile that while those days are over-at least he can drink beer now! Birthday warning! 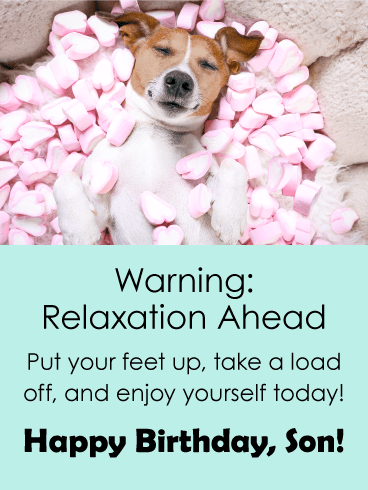 Relaxation ahead! 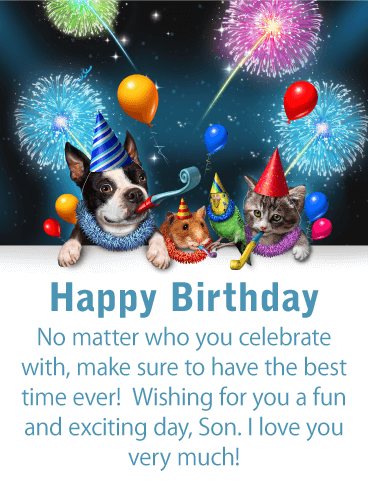 Send this funny birthday card for a son today. Help your son remember what his birthday is all about. Namely, taking it easy for once! 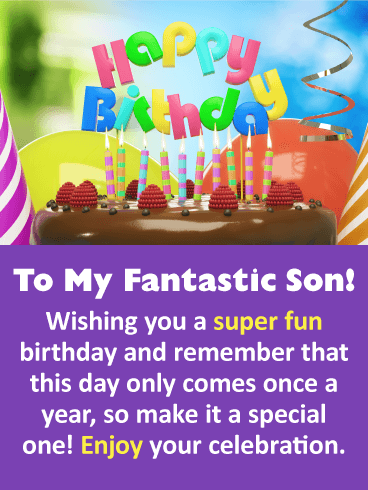 Wish your son a terrific birthday with a hilarious birthday card that will make him smile. 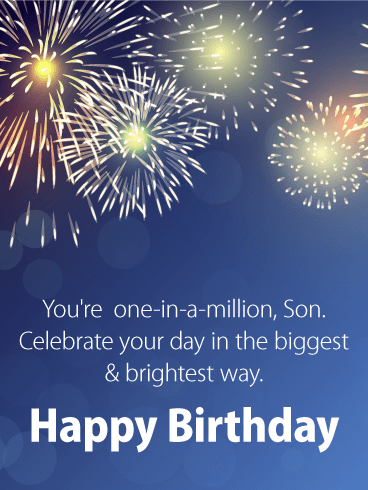 This fun birthday greeting is perfect for a son who works hard and rarely ever takes time for himself.